The SAEIndia collegiate club of SCMS was established in 23/09/2010. 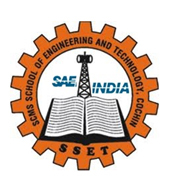 This club is affiliated to SAEIndia which is an affiliate of SAE International. SAE or Society of Automotive Engineers is a U.S.-based, globally active professional association and standards organization for engineering professionals with focus on Automotive, Automobile, Aerospace, Commercial vehicle and off road vehicle industries. The club is aimed in bringing out the blooming talents of students. It conducts activities in different aspects of automobile engineering. The main objective of this club is the overall & personal development of students by encouraging them to participate in international / national SAE Collegiate Design Series. To foster an environment of creativity and innovation by conducting interactive practical programs. To provide students opportunities to gain experience in administering organizational activities conducting meetings, taking part in committee activities and writing and speaking before groups. To stimulate student participation in projects that requires the application of engineering knowledge and promotes professional growth. 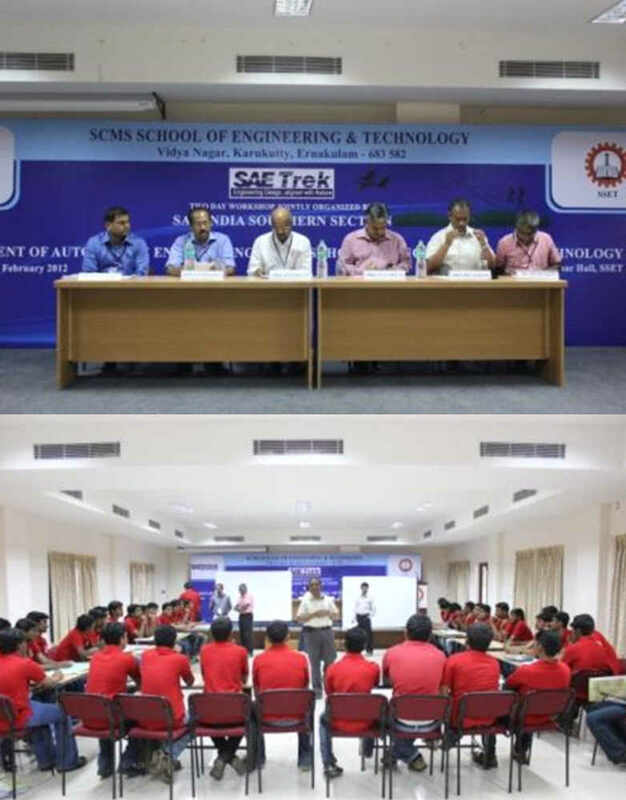 The department of Automobile Engineering – SAEIndia Collegiate Club of SCMS in association with SAEIndia Southern Section hosted Mr Kasiraja Thangapandian, Software Project Manager, Visteon Technical and Services Centre Pvt Ltd, Chennai, India and Joint Secretary of SAEINDIA Southern Section for a “EXPERT TALK” on Automotive Electronics on 22nd November 2018 from 2 to 4 p.m. 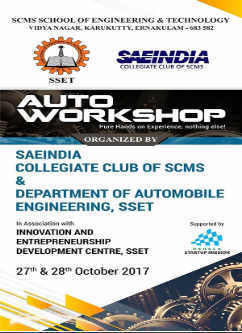 The Innovation and Entrepreneurship Development Centre (IEDC) of SCMS School of Engineering and Technology in association with SAE India collegiate club of SCMS has organised “SAE AUTO WORKSHOP” at Karukutty campus exclusively for Mechanical Engineering / Automobile Engineering students on October 27 & 28, 2017. Prof. P.C PILLAI, Senior Group Director, SCMS Group of Educational Institutions, Cochin, formally inaugurated the awareness programme. Prof. M. MADHAVAN, Principal, SSET, presided over the function. 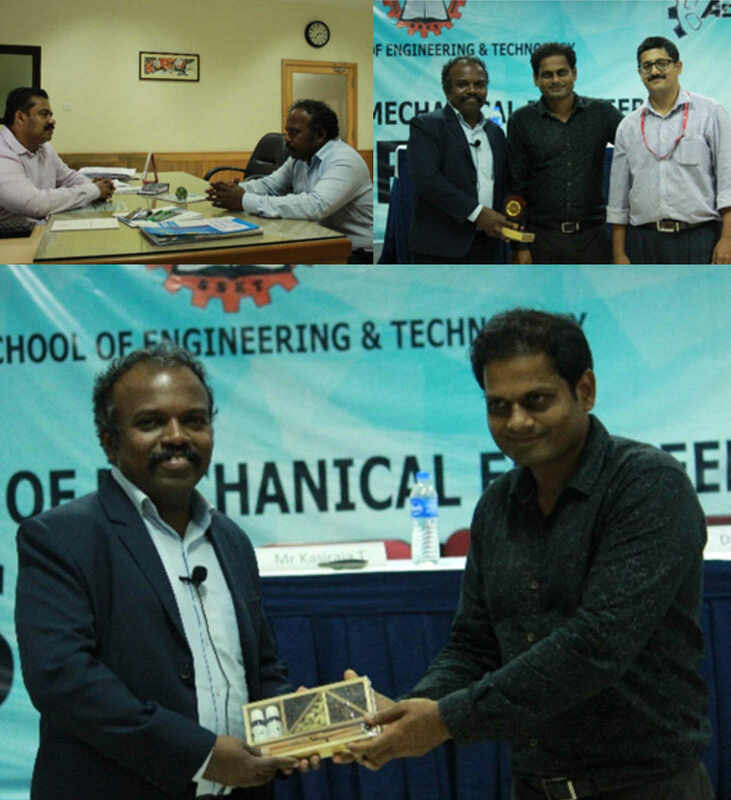 Prof. E.D MUKUNDAN, H.O.D, Department of Automobile Engineering presented the theme address. Mr. Koshy P Joseph, Assistant Professor, Department of Automobile Engineering gave the welcome speech and Mr. SUJAY. K, Assistant Professor, Department of Automobile Engineering proposed ‘vote of thanks. Mr. KIRAN HAREENDRAN, Final Year Automobile Engineering student has compered the event. 1. Mr Francis Thomas, Assistant Professor, ME Dept. 2. Mr Vipin Raj P.G, Assistant Professor, AU Dept. 3. Mr Aravind P.V, Assistant Professor, AU Dept. 4. Mr Sujay K, Assistant Professor, AU Dept. 5. Mr Koshy P Joseph, Assistant Professor, AU Dept. 6. Mr Haridas, Senior Technical Instructor, AU Dept. 7. Mr Antony, Technical Instructor, AU Dept. Prof. M. MADHAVAN, Principal, SSET, presided over the valedictory function. 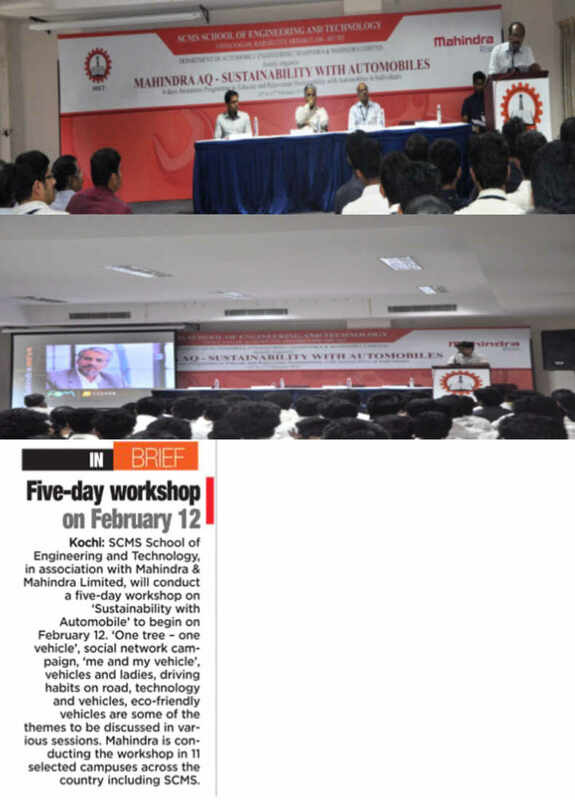 Prof. E.D MUKUNDAN, H.O.D, Department of Automobile Engineering presented the theme address. Mr Manoj Kumar B, Assistant Professor, Automobile Department gave the welcome speech and Mr. SUJAY. K, Assistant Professor, Department of Automobile Engineering proposed vote of thanks. Mr. KIRAN HAREENDRAN, Final Year Automobile Engineering student has compeered the event. A team of 24 students from our college under the team name V24 participated in SAEIndia BAJA 2013 which was conducted at Pithampur, Madhya Pradesh. 120 teams participated from all over INDIA our team finished at 30th position and we got ranked as the 1st from KERALA. The event focuses on the engineering and designing skills of the team members for making a four wheeled off road buggy. 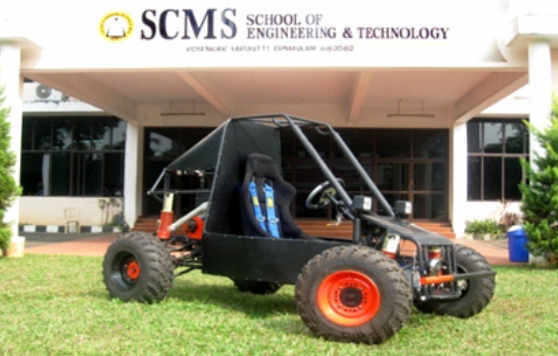 The buggy lovingly named “HITLER” by the team was designed and manufactured with the guidance and support of SCMS GROUP and the Automobile Department of SSET. 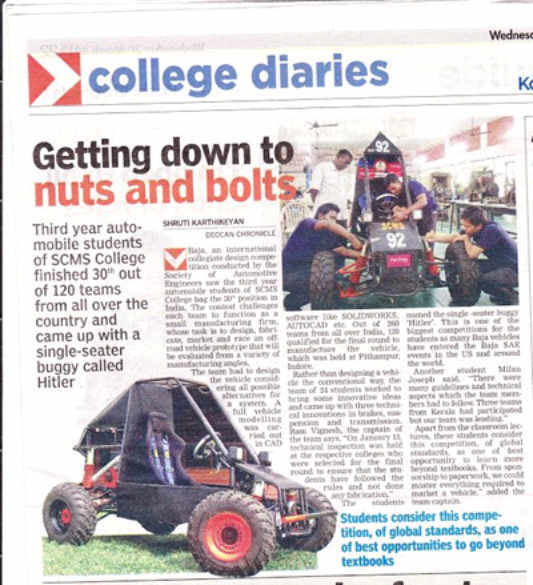 The first round was the VIRTUAL BAJA event conducted at Bangalore Institute of Technology, Bangalore in which 300 teams participated and only 120 teams got short listed.